The Calder Valley Line (also previously known as the Caldervale Line) is a railway route in Northern England between the cities of Leeds and Manchester as well as the seaside resort of Blackpool. 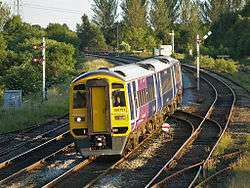 It is the slower of the two main rail routes between Leeds and Manchester (the other being the Huddersfield Line), and the northernmost of the three main trans-Pennine routes. This line, along with the Huddersfield Line and York and Selby Lines, is normally merged in national timetables to show a coast-to-coast service. Services within West Yorkshire are sponsored by West Yorkshire Metro, whose tickets (including Metrocards) can be used up to Hebden Bridge between Leeds and Blackpool, and Walsden between Leeds and Manchester. Before the 1923 Grouping the first section of the line (Leeds – Bradford) was owned by the Great Northern Railway (GNR); and the entire remainder by the Lancashire and Yorkshire Railway (L&YR), apart from the final section of the branch leading into Huddersfield, which was owned by the London and North Western Railway (LNWR). For the section between Halifax and Burnley the line uses the valley of the River Calder, which in fact comprises two separate valleys with rivers of the same name, that of West Yorkshire and the Lancashire River Calder thus giving the services their name; it also follows the Rochdale Canal from Todmorden into Manchester. Since the route crosses the Pennines, there are many tunnels to negotiate en route. The British Railways Board's Corporate Plan for 1983 – 1988 marked the routes between Milner Royd Junction (east of Sowerby Bridge) and Bowling Junction (south of Bradford Interchange); and Milner Royd Junction and Heaton Lodge Junction (west of Mirfield) to be 'singled' on a list "The Proposed Elimination of Non-Essential Multiple Tracks". 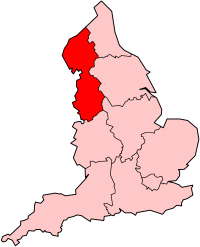 A combination of factors meant this was never implemented: the better gradients for freight than the Huddersfield trans-Pennine route; and the mid-1980s uncertainty over the Settle-Carlisle route meant that this became the preferred route for goods between Leeds and Preston/Carlisle. Today, Hebden Bridge and Leeds are the only stations where every service calls, the route description follows. For the initial section of the route between Leeds and Bradford, see Leeds and Bradford Lines. Low Moor also a junction with GNR. The station is due to re-open in 2016 but problems with disused mineworkings have caused delays to the re-opening. On 24 October 1901 as the 6.10 pm down goods train from Low Moor to Leeds to was passing through Bowling Tunnel, the rear section broke loose. It came to a stop in the tunnel and was run into from behind by the 9.05 pm goods train from Low Moor to Laisterdyke. Wreckage partly blocking the up line was then hit by the 9 pm passenger train from Leeds to Manchester. No one was killed but there was extensive damage to rolling stock. This route was re-opened to passengers in 2000 when Brighouse station was re-opened, and two short lengths of line relaid (after being out of use for 15 years) to enable trains to reach Huddersfield. here was the triangular junction for the line via Mirfield to Dewsbury; Brighouse station is on this line. the line now turns west into the Calder valley, joining the original 1840 main line at Milner Royd Junction. at Sowerby Bridge heading west the line used to branch off to Ripponden. It was originally intended to continue to Littleborough but ended at Rishworth. Closed to passengers 8 July 1929.
here is "Mytholmroyd Railway Viaduct"
On 28 February 1902 a Wakefield to Rose Grove goods train broke into two due to a broken coupling, resulting in the rear half eventually crashing at high speed into the front half in Millwood Tunnel. No one was killed but wreckage filled the tunnel right up to the roof. Summit Tunnel was the scene of a major fire in 1984, caused when a freight train hauling petrol tankers derailed. Trains continue up the Calder valley to Burnley and Blackburn; it also runs parallel with the Leeds and Liverpool Canal from Burnley. The section from Todmorden to Burnley (often called the Copy Pit line) was opened by the Manchester and Leeds Railway (later L&YR) on 12 November 1849. The East Lancashire Railway (later L&YR) built the Burnley to Preston line, Burnley to Accrington 18 September 1848, Accrington to Blackburn 19 June 1848, and the Blackburn to Preston section on 1 June 1846. The Rose Grove – Todmorden (Hall Royd) local service over this route ended in 1965, the only passenger services thereafter being a daily Leeds – Blackpool train. In mid-1982 the last tanker train travelled over the line, with the expectation of closure shortly after. A turning point came when the National and Provincial Building Society moved staff from Burnley to Bradford. The Society arranged for a Preston – Bradford Interchange train to be run to move staff from their home base to Bradford offices. In October 1984 British Rail developed this into five trains each way between Leeds and Preston with one extended to Blackpool. The Todmorden Curve is a 440-yard (400 m) section of track at Hall Royd Junction in Todmorden which was lifted in 1972. Originally Hall Royd Junction was triangular, and the lifted curve allowed services from Burnley to reach Manchester via Todmorden (regular services over it had ceased in November 1965). Reinstating the curve was a priority for Lancashire County Council and was ranked as the most important project in its 2010 Rail Improvement Schemes draft report. The government stated in March 2010 that reinstating the link would cost around £7 million and any new rail services would require initial subsidy. Burnley MP Kitty Ussher wrote to the North West Development Agency to seek assurance that it could find the money. In October 2010 Network Rail agreed to pay for the final assessment of the plans. This assessment, completed in May 2011, concluded that it could be feasible to reinstate the curve, although the original route could not be used as the original curve was deemed to be too sharp. An alternative route was instead put forward, and it was stated that, if funds could be obtained by early 2012 to carry forward the project, the curve could be back in use by the end of 2013. On 31 October 2011, the deputy Prime Minister announced that the scheme would be given the go-ahead. Construction work began in summer 2013, and the curve was planned to be available for the May 2014 timetable change. The track was completed and tested in May 2014, and services began on 17 May 2015.
here is the junction with the original line from Todmorden (to Burnley), forming a triangle (closed 1972, but reopened in 2015). Rose Grove has an island platform with 2 disused bay platforms. This line is described in more detail in East Lancashire Line. here was a junction for a direct route to Preston, the surviving route continues to Preston via Lostock Hall where there are further junctions, including one for the former through route to Liverpool. This route is described in more detail in Blackpool Branch Lines. Holme Tunnel, which lies between Hebden Bridge and Burnley Manchester Road, was closed for 20 weeks from November 2013 until March 2014. This was to allow for major engineering work to fix the distorted shape of the tunnel, caused by movement of the ground through which it passes. The project was budgeted to cost £16.3million. During the works, buses replaced train services. Trains can now pass through at 45 mph. Improvements to the line are proposed as part of Network Rail's Northern Hub plans, which would allow for more frequent services on the line. Some services via Bradford would also be extended to Chester, Crewe, Liverpool and Manchester Airport. The Chester and Liverpool services have since been incorporated into the Northern franchise agreement, these will start in December 2017 under the "Northern Connect" brand and will be operated by new 100 mph Class 195 diesel trains by December 2019. In 2018, the Manchester Airport trains will follow once the Ordsall Curve is completed. Low Moor station, between Bradford Interchange and Halifax, is due to be re-opened in May 2017. A business case is being developed to re-open Elland station between Halifax and Brighouse. ↑ Lowson, Rob (25 August 2015). "Workmen are all aboard to keep Low Moor station plans on track for spring 2016 opening". Telegraph and Argus. Bradford. Retrieved 18 November 2015. ↑ Wilde, Claire (1 April 2016). "Discovery of aeroplane-sized mine cavity delays opening of Low Moor railway station". Telegraph and Argus. Retrieved 5 April 2016. ↑ "Accident Report: Bowling Tunnel" (PDF). Board of Trade. 1901. ↑ "Accident Report: Millwood Tunnel" (PDF). Board of Trade. 1902. ↑ "Todmorden and Fleetwood top Lancashire's rail list". Rail (641). Peterborough. 7 April 2010. pp. 16–17. 1 2 "£7m. upfront price tag for Todmorden Curve rail link". Pendle Today. Nelson. 23 March 2010. Retrieved 10 April 2010. ↑ "UK News In Brief" (PDF). Railway Herald (241). 4 October 2010. p. 5. Retrieved 6 October 2010. ↑ Moseley, Tom (17 May 2011). "Todmorden Curve could be running by 2013". Lancashire Telegraph. Blackburn. Retrieved 18 May 2011. ↑ Magill, Peter (31 October 2011). "Major boost as £9million rail link cash announced for Burnley". Lancashire Telegraph. Blackburn. Retrieved 2 November 2011. ↑ "Todmorden Curve journeys to start after May 2014". Lancashire Telegraph. Blackburn. 31 July 2012. Retrieved 4 July 2013. ↑ "Campaigners hope curve will spring into life". Todmorden News. 15 October 2014. Retrieved 22 January 2015. ↑ Northern Rail. "New direct train services between Accrington, Burnley and Manchester". Retrieved 17 May 2015. ↑ "20 week closure for Holme tunnel upgrade". Modern Railways. 9 May 2013. Retrieved 15 September 2013. ↑ "Ground Force". The Rail Engineer. 7 November 2013. Retrieved 11 November 2013. ↑ "Holme Tunnel reopened on Monday 24 March". Northern Rail. Retrieved 12 April 2014. 1 2 "The Northern Hub". Network Rail. Retrieved 10 April 2010. ↑ "New station runs into further delay". Bradford Telegraph and Argus. Retrieved 26 July 2016. ↑ "Timetabling work complete ready for Bradford Low Moor opening in 2013". Rail (641). Peterborough. 7 April 2010. p. 20. Fox, Peter (December 1984). "Copy Pit Line Revival". Rail Enthusiast. EMAP National Publications. pp. 40–42. ISSN 0262-561X. OCLC 49957965. Wikimedia Commons has media related to Calder Valley Line.